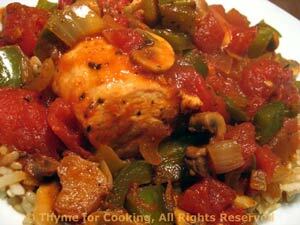 Chicken Creole, easy dinner recipes. One always thinks of shrimp or seafood with Creole, but why not the versatile chicken breast? There are lots of vegetables in the dish so I didn't do a separate side dish. Boneless chicken breasts, cooked with onions, peppers, mushrooms and tomatoes make a quick, healthy, dinner, perfect for midweek. Add Tabasco if you like more heat. Cut chicken breasts in half, the short way. Cut pepper in half, discarding seeds and top; roughly chop. Heat oil in large non-stick skillet over medium heat. Add the pepper, onion and sauté for 5 minutes. Add chili powder, garlic, mushrooms and sauté another 5 minutes. Push vegetables to the sides of pan and add chicken. Sauté until chicken starts to brown. Roughly chop tomatoes and add to chicken, along with juices, Worcestershire and herbs. Cover, reduce heat and let simmer 10 - 15 minutes, until chicken is done. Cook rice according to package instructions. Fluff and serve. Put rice on a small platter, spoon Creole over and serve.